Prathiksha added site permission settings for Location, Camera, Microphone and replaced the old permission dialog for Notifications in about:preferences. jkt has improved the WebExtensions contextualIdentities APIs to the point where the Test Pilot Containers experiment can run as a WebExtension. Legacy Extensions, including classic and add-on SDK extensions, are now disabled by default in Nightly. Contributor UK92 made it possible to customize the position of the back/forward and reload/stop buttons. Felipe landed a patch that moves random timeouts to idle callbacks and got some solid performance improvements. Activity Stream rolling out in 56 to 10% of users on en-US builds, geolocated in USA and Canada. Up next is shipping to more users in more locales, and rolling out Pocket recommendations in Germany. 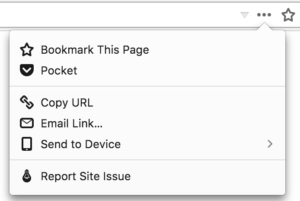 The Page Action now has a Pocket item. Code for a screenshots item has landed in screenshots’ github repo but needs screenshots to merge to m-c. Items can now be added/removed from the context menu. Finally, the Report Site Issue button has now also made its way into the page action menu for Nightly/DevEdition. The main toolbar now has 2 flexible spaces, one on either side of the url/search bar(s). The library button has also replaced the bookmarks menu button in the default toolbar set. ♥ Ami ♥ refactored `_handleMessage` in `UpdateTopLevelContentWindowIDHelper.jsm`. Luciano I cleaned up unused variables in Sync code. Numerous bugs on out-of-process webextensions have been fixed. kmag has fixed a bunch of webextension performance issues. Sending a message to a tab no longer instantiates lazy tabs. The browsingData API can now clear local storage. ntim has added toolbar colors and per-window themes to the themes API. Little fixes to webRequest, optional permissions, downloads, experiments, hybrid extensions. rpl fixed several bugs with browser actions, page actions, and options on Android. Landed pref’ed off in 56 Beta, with localization, snippets, performance telemetry, and Pocket recommendations. Adding “Recent Bookmarks” and “Recently Visited” to Highlights. Adding custom sections via a Web Extension. More customization for Top Sites: Pin/Dismiss, Show More/Less, Add/Edit Top Site. Creating a site summary pipeline (high-res page icons -> Tippytop -> Screenshot + Favicon). Optimizing metadata queries and Tippytop Icon DB improvements. Profile cleanup option has landed in the stub installer for 57. Users who are running the stub installer and have an older version of Firefox installed will be presented with the option to clean up their profile. LZMA/SHA384 changes have landed as of 56 beta 3. Felipe Gomes, Kirk Steuber, Adam Gashlin, Perry Jiang, Doug Thayer, Robert Strong closed 16 bugs and are currently on 11 more bugs. Planning to enable address autofill (with sync) on beta in the next two weeks for en-US builds geolocated in the U.S.. Please file any issues you see. The active area of the “Enable Profile Autofill” checkbox should expand to full width. We’ve migrated any additions you made to the old hamburger panel to the overflow panel, and removed some of the old code as well as the photon structure pref. There’s still a lot more to remove, see this bug if you have cycles to help. The Windows 10 Start Tile will now update with the new icon upon Firefox update. It previously only updated the icon for new installs. We’re mostly fixing bugs and polishing things right now. ntim updated the close icon style to match the Photon spec. The new tab close icons! Contributor Michael Kohler renamed the compact themes to just “Dark” and “Light” and removed all the MOZ_PHOTON_THEME ifdefs (phew!). Johann added a UI migration for compact dark/light themes to enable compact mode. Dão removed the tab title centering on Mac, making it consistent with our tab titles on the other platforms. Continuing on visual refresh and update for 57. Please file bugs for visual styles in Preferences, Add-on Manager, other in-content pages, etc. Prathiksha made it that we hide the permission section in the identity popup on pages that display chrome UI (on about: pages). We’re wrapping up iOS bidirectional sync work! All Test Pilot experiments are off the Add-on SDK now! All Test Pilot add-ons are getting signed through a new signing pipeline (not AMO) to allow for non-WebExtensions in the future. Planning to roll out Screenshots to Release in the next couple of weeks. Are there more of “these weeks” going to be published? I really liked the previous two.